Movable Type comes with many templates installed by default, though the exact templates installed depends on the theme chosen for the initial website and blog. To view default templates for any given version of Movable Type for reference purposes, you can browse the default_templates directory of the Movable Type GitHub repository. 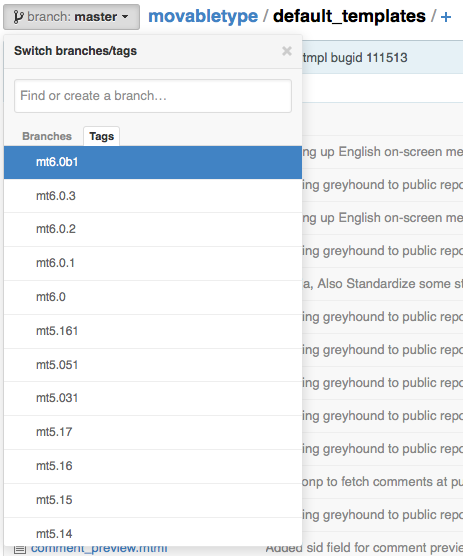 Simply click the branch selector at the upper left that reads “branch: master”, click “Tags” and select the version of interest. To view templates specific to themes shipped with Movable Type beginning with version 5, navigate to the themes directory of the repository, click the theme folder name, and then click the templates folder. For example: Movable Type 6.0.3 Classic Blog templates. Coming Soon: MT4 Default Templates (flat, sans-includes)…. @Wonder Chicken - the community is maintaining a set of template sets on the Movable Type Wiki for all the various template sets one can use with MT4. Check it out. I don’t think they are complete with flattened templates, but I do believe some progress has been made. haha, how soon is soon? I’ll design a new temaplate myself. I have MT 5, is it possible to use some of the previous templates? And what about MT 6? @Silvia: Yes, all or most of the tags in the previous templates should still work in Movable Type 5, but the interdependency of templates has changed, so you may need to make modifications. Movable Type should display a helpful error message upon publishing if there is a problem. @Paul: I replaced the older links to .mtml files on this domain to the GitHub repository, as that should be more helpful and easier to maintain in the future.